Unfortunately, the link containing these configurations and images seem to has been lost to time. I'm wondering if there's a site that has the necessary files and images for various conky setups, I keep finding megathreads full of broken links and pages of discussion that has to be scrolled through to get to the next actual setup, two pages away. It seems the best fit for that space is a 5-7 day forecast type of thing I posted the image to above. Any help sorting that out would be greatly appreciated. 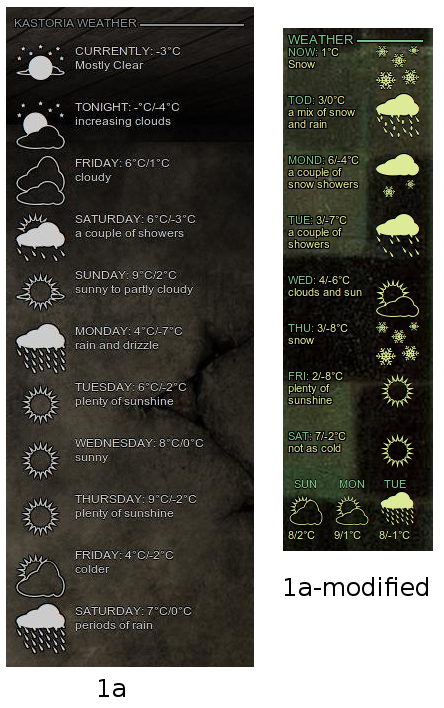 @TeoBigusGeekus's links at the start of the Conky weather+moon scripts (Accuw/WUndergr/NWS/MoonGiant) thread are working. There should be plenty there to get your teeth into.